Are you seeking ways to dodge the next stock-market downturn? We'll get you up to speed on that and more. I'm Jessica Menton, bringing you the latest on today's pre-market moves. Stock futures are sagging after back-to-back days of gains. The Nasdaq, meanwhile, is looking to extend its winning streak to eight days. Investors are eyeing results from CVS Health and Analog Devices this morning, followed by Agilent Technologies after the closing bell. Minutes from the Fed's latest meeting are on tap. Traders will parse the release for more clues into the central bank's economic outlook. Some investors are concerned that the assumption underpinning the stock market's recent rally—that the Fed has stopped raising rates—could be wrong. Plus, some investors are scooping up “smart” funds. Our Asjylyn Loder weighs in on the pros and cons of adding exposure to these ETFs as investors look for opportunities to evade stock-market turbulence. U.S. stocks were poised to weaken despite upbeat trading elsewhere on Wednesday, as investors awaited further information on White House trade talks with China. Investors hunting for protection after last year’s market turbulence are snapping up so-called smart funds in the hopes of sidestepping the next downturn. The S&P 500 has advanced 11% so far this year, but that hasn’t stopped investors from looking for a safer way to bet on stocks. Two of the biggest exchange-traded funds that try to pick less volatile stocks have been among the most popular so far this year. A surge of new money has pushed assets in both the iShares Edge MSCI Min Vol USA ETF and the Invesco S&P 500 Low Volatility ETF to record heights. In all, ETFs that try to pick less risky stocks have taken in $11.3 billion since the beginning of November, according to Morningstar. 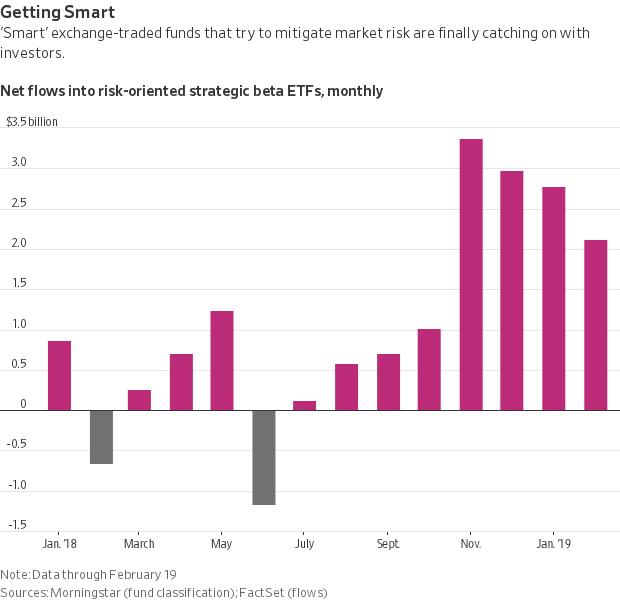 The funds, billed as “smart beta” or “strategic beta,” are pegged to bespoke indexes that target stocks that are less susceptible to violent price swings. ETF issuers have been trying for years to get cost-conscious passive investors to embrace more sophisticated—and pricier—styles of index investing. Last year’s rocky markets finally did what slick marketing and backtests failed to do: provide a real-world example of how such funds can outperform when markets are topsy turvy. Larry Carroll, chief executive of Carroll Financial, said his ETF of choice is the iShares Edge MSCI Min Vol USA ETF, which aims to pick a less volatile mix of U.S. stocks. Its three biggest holdings are Newmont Mining, Waste Management and Visa, compared with Microsoft, Apple and Amazon.com for the iShares plain-vanilla S&P 500 ETF. Mr. Carroll said the fund accounts for 5% to 10% of his clients’ stock portfolios. In the past year, both Mr. Carroll’s iShares ETF and the competing Invesco ETF have handily beat the iShares ETF that tracks S&P 500. Both ETFs have returned more than 10%, compared with just 3.6% for the S&P 500 fund. The iShares ETF and the Invesco fund aim to smooth out market upheaval. They’re built quite differently though, which can have a meaningful impact on returns. Investors, however, win less when the markets are on the way up. So far this year, both the iShares and Invesco low-volatility ETFs are up more than 9%, trailing the S&P 500’s 11% gain. Renewed geopolitical uncertainty on U.S.-China trade talks and a weaker dollar helped power gold prices up 1.7% to $1,340.10 a troy ounce on Tuesday, their highest close since April 19 and their biggest one-day advance since Nov. 1. The precious metal has climbed 4.8% this year. Yields on shorter-term debt, which tend to move in tandem with investors’ interest-rate expectations, retreated this week. The yield on the two-year Treasury note settled at 2.500% Tuesday, compared with 2.520% Friday. The yield on the two-year Treasury note has fallen for three consecutive months, its longest such streak since 2013, according to Dow Jones Market Data. Yields fall as bond prices rise. On this day in 1852, a locomotive of the Michigan Southern railroad arrived in Chicago, connecting the breadbasket of the world directly with the Eastern U.S. for the first time. Instead of more than two weeks by horse, coach and canal boat, it took just two days by rail to travel from New York City to Chicago. Goods, money and people could flow between the two booming cities faster than anyone had ever imagined. The Dallas Fed’s Richard Kaplan speaks in Houston at 1:10 p.m. ET. The Federal Reserve releases minutes from its Jan. 29-30 policy meeting at 2 p.m.
Why are there calls to restrict stock buybacks? 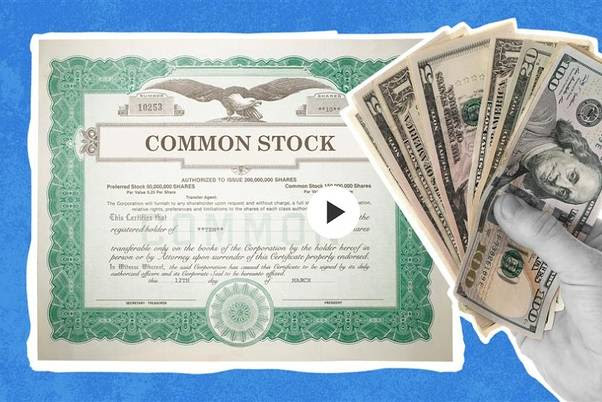 In the video above, our Ken Brown explains the basics of buybacks and the economics of lawmakers' proposals to limit them. Investors are sounding a warning about markets’ complacency on rates. Stocks and bonds are rising on bets the Fed has ended its interest-rate increases, worrying investors who believe the central bank could upend those expectations later this year. Customers hunt for a bankrupt crypto exchange’s missing millions. An unusual cash-pickup system is the latest unusual business practice at Quadriga to emerge since Gerald Cotten, the firm’s 30-year-old co-founder and CEO, died in India late last year. Who needs free? Passive fund prices have flatlined. Zero-fee exchange-traded funds have failed to take off as investors accept higher costs for finer-tuned strategies. Markets warm to the prospect of an ECB funding boost for banks. Market participants are growing confident that the European Central Bank will soon try to boost the eurozone’s ailing economy by rebooting its program of ultracheap long-term loans to the banking system. The SEC wants to make it easier for companies to explore IPOs. Any company exploring whether to go public would get greater leeway to discuss their plans privately with potential investors before announcing an initial public offering, under a proposal that securities regulators released Tuesday. Herbalife Nutrition: The company reported a 9% sales increase in the fourth quarter, driven by strong growth in Asia. PepsiCo: Hormel Foods said the beverage giant will buy the company's CytoSport business, which makes Muscle Milk, for an undisclosed amount. Analog Devices: The chip maker said late Tuesday that its board of directors voted to raise the company's quarterly dividend to 54 cents a share, an increase of 12.5%. La-Z-Boy: The furniture maker's profit and sales results for the latest quarter topped analysts' estimates. LendingClub: The peer-to-peer lending company missed Wall Street's fourth-quarter revenue expectations.